Just as rivers move sediment across the land, turbidity currents are the dominant process carrying sediments and organic carbon from coastal areas into the deep sea. Turbidity currents can also destroy underwater cables, pipelines, and other human structures. Unlike rivers, however, turbidity currents are extremely difficult to study and measure. 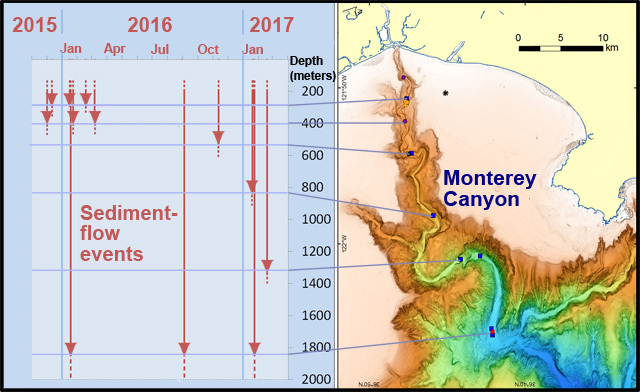 At the Fall 2017 meeting of the American Geophysical Union, scientists from around the world will present 19 talks and posters about the Coordinated Canyon Experiment—the most extensive, long-term effort to monitor turbidity currents ever attempted. 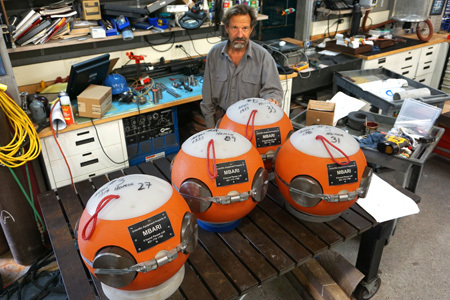 The results of this two-year project challenge existing paradigms about what causes turbidity currents, what they look like, and how they work. 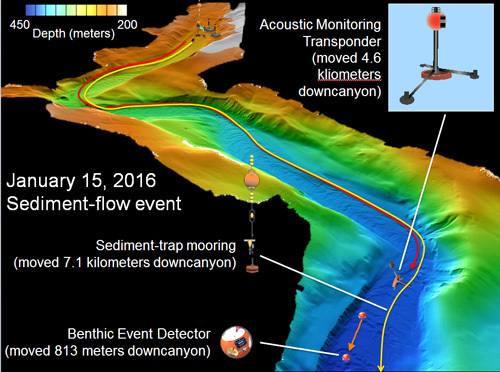 The first quantitative data showing that, in early stages of some events, entire sections of seafloor may move as a semi-fluidized mass—a process that has not been previously documented in the scientific literature.